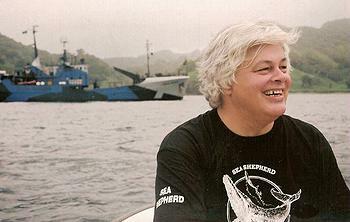 FRANKFURT, Germany, May 19, 2012 (ENS) – Sea Shepherd founder Captain Paul Watson has been granted bail by the German Higher Regional Court in Frankfurt, and his attorney expects him to be out of prison on Monday after a week of incarceration. Watson was arrested May 12 in Germany for extradition to Costa Rica. The German police have said that the warrant for his arrest is in response to an alleged “violation of ships traffic” in Costa Rica, which occurred in April 2002. As ENS reported at the time (ENS April 24, 2002 and ENS May 21, 2002) the Sea Shepherd Conservation Society had formed an alliance with the Costa Rican government that was to have given the society official status to intervene against illegal fishing for sharks in Costa Rican waters around Cocos Island, a national park on the UNESCO World Heritage List. Costa Rica had invited Watson to sign an agreement formalizing the alliance on April 30, 2002. 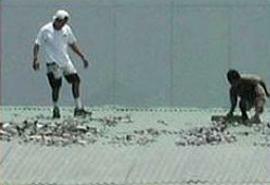 The agreement was never signed, but the illegal fishing around Cocos Island was “rampant,” Watson said at the time. The incident for which Watson has been detained in Germany took place on April 24, 2002. At the helm of the Ocean Warrior, on the way to Costa Rica, Watson came upon a Costa Rican registered fishing vessel, the Varadero I, 145 miles off the west coast of Guatemala. The vessel, owned by Franklin Martinez, was poaching, Watson observed. It had dropped 50 miles of longline inside Guatemala’s 200 mile no take zone and had killed six sharks. Sea Shepherd Operations Director Lori Pye in the organization’s Santa Monica office told ENS at the time that Sea Shepherd conservation ships operate under the World Charter for Nature. “It says if we do come across poachers along the way, and no one is doing anything about it inside the no take zone which is 200 miles off a coast, we can try to do something about the poachers,” Pye explained. In accordance with this policy, Watson contacted the Varadero I and demanded that they pull in their illegal lines and release all marine life. The Varadero I refused; Sea Shepherd crewmembers cut one of the lines. The Varadero I fled with the Ocean Warrior in hot pursuit. Catching up with the poachers, Watson demanded that they pull in all fishing lines and release the catch or the Sea Shepherd crew would pull in the lines. The Varadero I agreed, and the Ocean Warrior stood by as the longlines were pulled in and 14 sharks were released. Watson contacted Guatemalan officials with the Environment Ministry and with the Guatemalan Embassy. He was told to turn over the poachers to the Guatemalan Coast Guard. The Ocean Warrior took the Varadero I under tow to turn the poaching vessel over to the Guatemalan Coast Guard, but released the vessel when its captain complained that the tow was too rough. Immediately, the Varadero I fled. Several hours later, the Ocean Warrior recaptured the Varadero I 170 miles off the Guatemalan coast. “The poaching vessel tried to ram the Ocean Warrior in an attempt to thwart capture, however, Captain Paul Watson was able to maneuver his ship so that the two vessels side-swiped each other, rather than colliding,” the Sea Shepherd Society said at the time. Watson followed the Varadero I to the port of San Jose, Guatemala all night. The next morning, within 60 miles of the port, Watson was informed by the port captain that he would be arrested if he brought in the Varadero I. 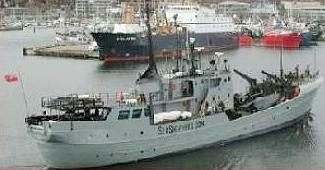 A Guatemalan gunboat was sent to intercept the Sea Shepherd crew. The crew of the Varadero I accused the Sea Shepherd crew of “trying to kill them, while the video evidence proves this to be a fallacy,” the Sea Shepherd office said Thursday. “To avoid the Guatemalan gunboat, Sea Shepherd then set sail for Costa Rica, where the crew uncovered even more illegal shark finning activities in the form of dried shark fins by the thousands on the roofs of industrial buildings,” the Sea Shepherd office said. In an unusual move, the decision on extraditing Watson will be made by the German government, according to statement made by the German general public prosecutor and the Higher Regional Court in Frankfurt. First the general public prosecutor stated in his motion to the Higher Regional Court that the Ministry of Justice and the Ministry of Foreign Affairs have the power to stop the extradition process if they believe it to be politically motivated. 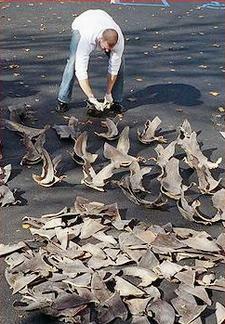 Shark fin trading in Costa Rica, or shark finning, is an illegal practice in the country. 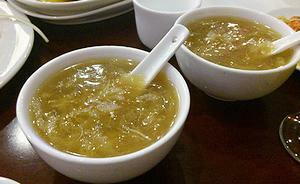 The illegal trade in Costa Rica is known to be controlled by the Taiwanese mafia because of the high value of shark fins in restaurants in countries such as Taiwan, Hong Kong and China where shark fin soup can cost up to $100 a serving in top restaurants. Sea Shepherd, the international marine life defense organization that Watson founded in 1977, has mounted an international campaign to save Watson from extradition to Costa Rica, where he might be killed. Supporters are being asked to contact German Federal Minister of Justice Sabine Leutheusser-Schnarrenberger and Minister of Foreign Affairs Dr. Guido Westerwelle on his behalf. Sea Shepherd representatives were able to visit Captain Watson in the Frankfurt prison on May 16 and recorded this statement. “In our efforts to defend the lives of whales, dolphins, seals, sharks, and fish we have made some powerful enemies, most notably the government of Japan. It is no coincidence that the extradition request by Costa Rica was issued the same month (October 2011) as the Japanese whaling (ICR) lawsuit against Sea Shepherd was initiated,” Watson said. “The extradition request was in reference to a complaint from Costa Rican fishermen who I caught poaching in Guatemalan waters. The fishermen were not injured and their boat was not damaged. The incident was fully documented for the film Sharkwater,” Watson said. Since the Costa Rican government issued the warrant for his arrest in October of 2011, Watson has traveled to Australia, France, Spain and the United Kingdom, none of which have sought to detain him. Watson, a Canadian, founded the international nonprofit, marine wildlife conservation organization in Vancouver, British Columbia in 1977 as the Earth Force Society and changed its name to Sea Shepherd Conservation Society the following year. Incorporated in the United States in 1981 in the state of Oregon, Sea Shepherd is now based in Friday Harbor, Washington. In its more than 200 voyages, Sea Shepherd has used direct-action tactics to investigate, document, and take action to expose and confront illegal activities on the high seas. Crews have defended whales, seals, sharks and bluefin tuna. One-third of open ocean sharks are threatened with extinction yet are virtually unprotected, according to 2009 research by the Shark Specialist Group of the IUCN’s Species Survival Commission. The first study to determine the global conservation status of 64 species of open ocean sharks and rays showed that 32 percent are threatened, primarily due to overfishing, and 52 percent of the shark species taken in high-seas fisheries are threatened.